Concord—the primary cultivar grown in the Northeast and the standard for hardiness. Niagara—the leading white grape cultivar, though it is not as hardy as Concord and is moderately susceptible to several grape diseases. Catawba—a late-ripening red cultivar that requires a favorable site and a long growing season to reach full maturity. Delaware—one of the highest-quality American bunch grapes, both for eating fresh and for making white wine. It ripens two weeks before Concord. The tender skin of the red berries, however, is subject to cracking, and the leaves are susceptible to fungal diseases. 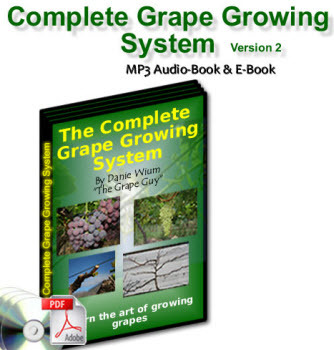 It requires a deep, fertile, well-drained soil for satisfactory vine growth. Ontario—the best of the early-ripening American cultivars. It produces white fruit. Vines are vigorous but not as hardy as those of Concord. Another grape species, Vitis vinifera, is native to southern Europe and recognized throughout the world for its wine quality. Chardonnay, Riesling, Cabernet Sauvignon, and Gewurztraminer are cultivars derived from V. vinifera. Unfortunately, these cultivars are extremely sensitive to cold temperatures. Some are grown successfully in the Northeast by taking special precautions, such as burying the canes each fall and tying them back up to a trellis in the spring. Choose disease-resistant cultivars that are hardy for your site. Make sure your site gets full sun and has good air drainage. Prune vines annually during the dormant season, removing up to 90 percent of new growth. Vinifera grapes are too sensitive to cold to be grown in the coldest areas of the Northeast. Several cultivars have been derived from crosses between species. The most important group is from crosses between V. vinifera and V. labrusca. These French-American hybrids produce good wines yet are much hardier than the V. vinifera parent. Baco Noir and De Chaunac are very vigorous red wine grape hybrids, but they require cluster thinning to keep plants from producing too much fruit and weakening the vines. Aurore is one of the best white-wine grape hybrids for consistency of production, but the berries tend to split. Seyval, Vidal, and Cayuga (white), Marechal Foch (black), Cascade (blue), and Chancellor (red) are all excellent wine grape hybrids. Horizon is a high-yielding cultivar that produces neutral white blending wine grapes, and it is relatively free of defects that affect its culture or use for wine. Seedless grapes for fresh consumption can be grown throughout the country, but the cultural practices used to grow them are different from those for the other three groups. See "Seedless Table Grapes," page 52. For more information on cultivar selection, see "Wine and Juice Grape Varieties for Cool Climates" at www.nysaes.cornell.edu/hort/faculty/reisch/ bulletin/wine/index.html. How to prune Vitis labrusca 'delaware'?